Come on in and join the family – make yourself at home! We have just enjoyed two great festivals, Christmas and Easter and a long summer break with great, atypically seasonal weather. 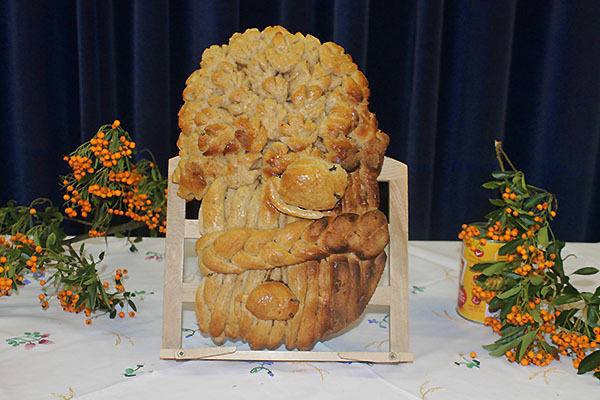 And now we look forward to the harvest when we celebrate the earth’s bounty, and remind ourselves of our responsibility to to ensure ‘fair shares for all’.This bounty is symbolised by the loaf of bread – and here you see the loaf baked by Ann for last year’s Harvest Festival – with its wonderful little harvest mice clambering over a golden sheaf of wheat. Come and join the celebration on Sunday the 24th September at 10.30 am. All the fresh produce, dry and tinned food that we bring will go to local children’s charities. The pictures below also give some idea of what we get up to.